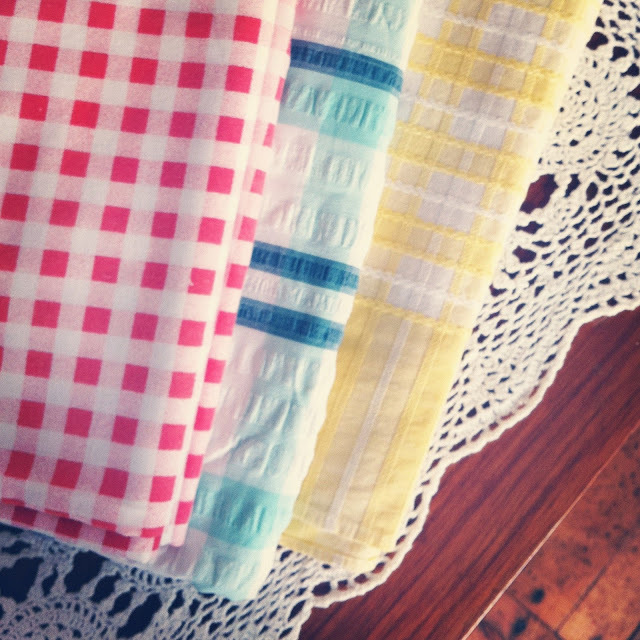 Before we all head out for the weekend I just had to show you these cute vintage tablecloths I thrifted today. Aren't they so bright and cheery! They just jumped out at me amongst the piles of drab 80's bedlinen, so I couldn't say no. I think the yellow may be my fav? which is yours? It's making me eager to get my dining room finished now, I just have to wait for the boyf to fix the leaky roof (gggrrhh!) then I can work my magic with the paintbrush and get the job done at long last! I'm soo impatient, haha! oh and I have just now signed up to Pinterest at long last!!! I have been trying to sign up for way over a year now, and it never accepted me! so yesterday I got Robin to sign up with his email instead and it worked straight away, duhhh! should have tried that ages ago... anyways you can find me @messyjesse1. A couple of questions about it first, how do I find people I know? and, I saw lots of pictures from my blog and etsy shop before I signed up now I can't seem to find them, any help would be much appreciated! Ah, Pinterest. I've found that sometimes the pins show up and sometimes they don't. Hopefully Pinterest has people working to fix it. From my experience, it's easier to find people by Googling them with Pinterest in the search criteria. When I try to use the search function on Pinterest, it doesn't always work. I'm going over right now to find you and add you to my list. Have a wonderful weekend! Love your tables cloths! I think I like the blue :) Although they are all adorable. I love pinterest! I make one of my boards a "Gingercake" board. Then i can track other gingercake pins. Also- my blog stats show when hits come from pinterest and I can track that way. I'll check you out over there! Pinterest is addictive!